Whereas the previous chapter looked specifically at mobile phones and their perceived impact, this chapter focuses on the perceived changes brought about by increasing internet and social media use. Majorities of the public in every country surveyed feel the internet is having a positive influence on education, and these assessments are often more positive than they were four years ago. In the three Middle East and North African countries surveyed, people are more pessimistic about the internet’s influence on politics than they were four years ago. And publics are also skeptical about the effect the internet is having on their children. Generally, people in most countries think mobile phones and the internet have had similar impacts on society – whether for good or for bad. And, although pluralities in most countries say social media have been a good thing for society, large minorities see downsides as well – a sentiment that is even more common among those who do not use social media. In addition to asking respondents how they think mobile phones have impacted society, the survey asked an identical series of questions about the influence of the internet. By and large, publics feel similarly about the influence of mobile phones and the influence of the internet. Roughly equal shares within most countries say mobile phones and the internet have had a good influence on morality, politics, physical health, local culture, civility and the economy. As was the case with mobile phones, many publics in these countries are especially concerned about the influence the internet has had on children. Internet users and non-users have fairly similar views on how internet use has impacted many aspects of their societies. But users are somewhat more upbeat than non-users about the internet’s influence on politics and the economy. But when it comes to the influence these technologies are having on education, many publics do see the influence of the internet and that of mobile phones in different lights. In six of the 11 countries surveyed, more people say the increasing use of the internet is having a good influence on education than say mobile phones are having a good influence on education. Focus groups in four of the countries surveyed revealed some of this tension (see Appendix A for more information on how the groups were conducted). Whereas some focus group participants cited the educational benefits that stem from children using the internet to do their homework or research, others highlighted phone addiction, games and other distractions as things that hinder studies. In five countries, people differ in their views of the impact of mobile phones and the internet on family cohesion. Where these differences exist, more say mobile phones have had a good influence on family cohesion than feel the same about the internet. Venezuelans and Kenyans stand out for their different evaluations of the impacts of mobile phones versus the internet on these aspects of society. Venezuelans are generally more likely to say the internet has had positive influences on many facets of society, while Kenyans are more likely to say mobile phones have had a positive impact. Internet use has generally risen substantially since 2014, when Pew Research Center last asked people in these emerging economies about the internet’s influence on key facets of their societies.13 With these changes, opinions about the positive and negative impacts of the internet in many countries have also shifted. In general, over time – and as more people have gone online – views of the internet’s influence on society have often grown more positive, especially when it comes to assessments of its influence on the economy and education. In many countries, people’s views of the internet’s influence on the economy and education have generally improved in the past four years. In seven of the 10 countries for which trends are available, more people today say the increasing use of the internet has had a good influence on their country’s economy than said the same in 2014. And in six countries, more say the internet’s influence on education is positive compared with four years ago. Publics in Lebanon, Kenya, South Africa, Mexico and Vietnam have grown more positive about the internet’s influence in both areas. Lebanese views of the internet’s influence on education have shifted especially strongly: In 2014, just one-in-five felt the internet was having a good impact on the economy, but today the share has roughly doubled to 42%. Jordanians have also become much more positive about the internet’s influence on education: 71% feel it is having a good influence on education today, compared with less than half (44%) four years earlier. Rising internet use overall appears to play some role in many publics’ increasingly positive assessments of the internet’s impact on the economy and education: Internet users in some countries are more likely to see the internet’s impact in a positive light. But rising internet adoption is only part of the story. For instance, more South Africans have access to the internet today than did in 2014, but views of the internet’s influence on the economy improved among internet users over the same period as well. Four years ago, 56% of South African internet users felt the internet was having a good influence on the economy, and today, 66% feel it does. In Tunisia, too, internet use has become more widespread since 2014. Yet opinions there about the internet’s influence on their economy and education have actually grown more negative. In other instances, changes in public sentiment have been driven largely by non-internet users. For example, in 2014, 71% of Kenyan internet users felt the internet was having a good influence on the economy, while a similar portion (67%) say the same today. But among Kenyans who do not use the internet or own a smartphone, views have improved, from 50% expressing optimism about the internet’s influence on the economy in 2014 to 61% saying the same today. While many of these publics have generally grown more positive about the internet’s influence on the economy and education in recent years, fewer have grown more positive about its impact on morality and politics. 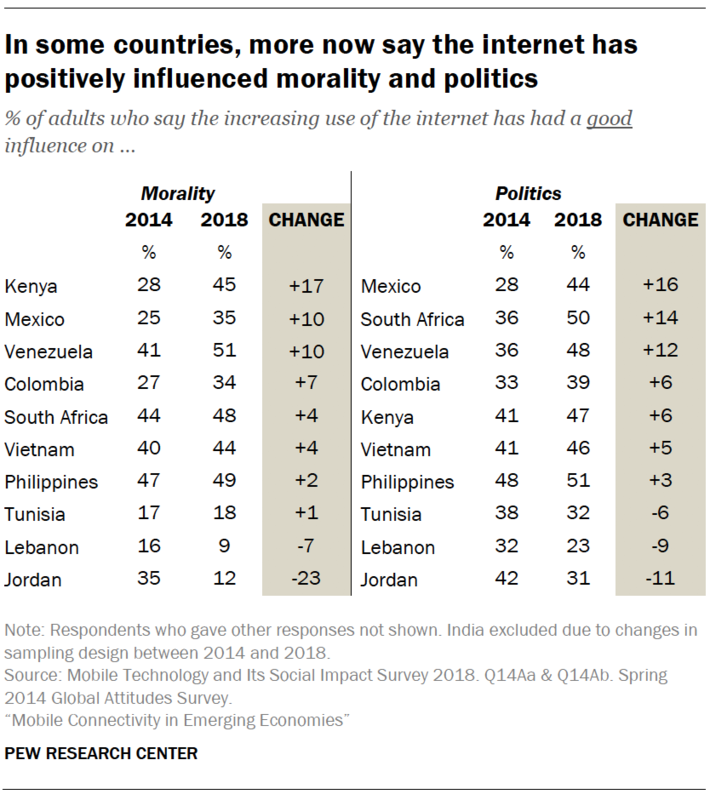 Colombians, Kenyans, Venezuelans and Mexicans have become somewhat more optimistic about the internet’s impact on morality and politics. But Jordanian and Lebanese adults have grown more pessimistic over the same time period. The greatest change in public opinion on these questions has occurred in Jordan, where the public is much more pessimistic than it was four years ago. In 2014, about a third of Jordanians said the internet was having a good influence on morality and 42% felt it was positively influencing politics. Today, those figures stand at 12% and 31%, respectively. In seven of the 11 countries surveyed, half or more say that social media have mostly been a good thing for society. But around one-third or more in eight of these countries express ambivalence – or outright skepticism – about social media’s impact. Vietnamese are the most optimistic about social media, while Indians and Lebanese are notably less positive. 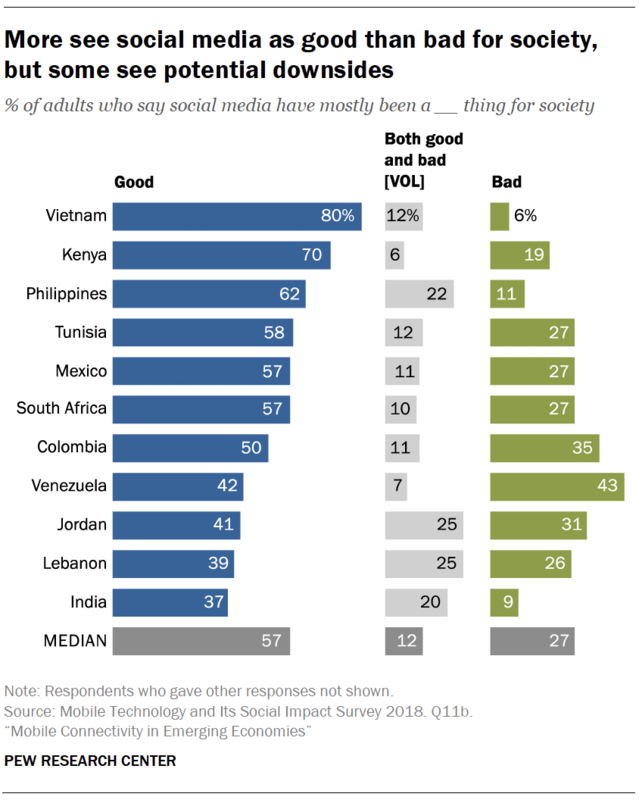 But even in India, many more say social media have been good (37%) for society than bad (9%), while about a third do not give an opinion on the matter. Venezuelans offer a split verdict: 42% feel social media have been a good thing, while 43% say they have been bad. As was true of mobile phones, people in the 11 countries surveyed often feel that social media have been better for them personally than for society as a whole. A median of 63% say social media have been a good thing for them, compared with a median of 57% who say they have been good for society. Even among those who themselves use social media and messaging apps, more see personal benefits than societal benefits in nearly all countries. This gap is largest in Jordan and Colombia. In these countries, around three-quarters of social media users say social media have been good for them personally – while only around half or fewer say they has been a good thing for society. Users of social media platforms and messaging apps are often more likely than non-users to view these platforms as having a good impact on society as a whole. These differences are especially notable in Lebanon, India and Jordan, where there is a difference of more than 20 percentage points in the shares of social media users and non-users who say these platforms have been beneficial for society. By contrast, users and non-users in Venezuela, the Philippines and Vietnam tend to see the social impact of these platforms in similar terms. These differences between users and non-users tend to exist across all age groups and education levels. But in some countries, such as Mexico, Tunisia and Lebanon, younger and more highly educated social media users are more likely to feel positive about social media’s societal effects than older or less-educated users. For instance, in Mexico, two-thirds of 18- to 29-year-old users feel that social media have mostly been a good thing for society, compared with about half of social media users ages 50 and above. There is a similar 10-point gap on this question between Mexican social media users with a secondary education or more (66%) and users with less than a secondary education (56%).